Are you going for a job interview and feeling nervous and unsure of how to answer certain questions, what to wear, and the general "etiquette" of interviewing? Here you will find hands-on, practical help. From 15+ years experience as a Career Counsellor, plus experience as an employer and of course, experience as a job seeker, Fiona MacKay has written a series of useful, ready-to-make-use-of articles to help you ace that interview. For a sneak peak of what is in store, look at the tables of contents below. the two volumes come separately, for your convenience. or all of the contents as are in the combined PDF book. Or you can click here to read a free PDF table of contents of both Volumes. The answers you give to questions are important, but you need to know not only the answers but the best way to give the answers, and all the other things that make an interview go well or fail. Don't miss out on your next "dream job". Here you will find the help you need. What extra Employer Benefits do you bring? Continued from Volume 1 - More help on how to interview successfully. Interview questions and answers, tips and tactics to help you impress the employer, ace the interview and get the job you want. What did you least like about your last job? Interview questions: What if I can't think of an answer? 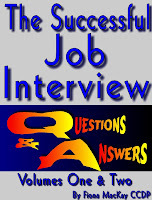 "The Successful Interview: Answers and Questions"
And all success to you in your interview. I think I put the comment in the wrong place before ... excellent books. Terrific information, practical and down to earth. Thanks for the help. It must be a very good book to read if you are a job seeker. Try interview coaching Edmonton. It might help you even more. Good info on this site for job seekers and beginners.. Thanks to Madam Fiona. Mam, I would like to invite you to be a speaker for our viewsletter and whote papers at ApnaCircle. Thank you for your valuable words here...!